Mira Kapoor realises how her baby daughter, Misha Kapoor, is growing up so fast she is unable to even capture her in full frame. How cute! 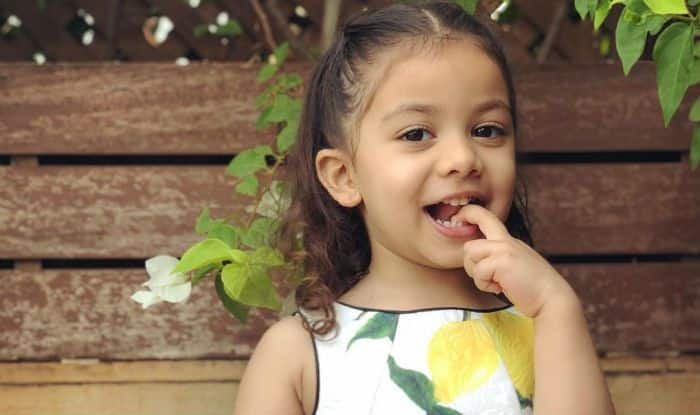 Mira Rajput Kapoor has shared a new picture on her Instagram timeline and it’s too adorable for words. The caption on the post makes it even more lovely. It’s the photo of Mira’s and actor Shahid Kapoor‘s daughter Misha Kapoor. The girl looks as cute as a button in the picture wearing a flower-printed frock and hair tied in two little ponytails. With the post, Mira has revealed that she has been clicking Misha at the same location since always but it suddenly struck her that her daughter has grown up enough to not fit in the frame. The caption on Mira’s post reads, “My big little girl  Clicking you in the same spot since the start and suddenly you don’t fit in my frame! How did you grow up so fast.. My darling. Naughty and kind. God blessed us. On the work front, Shahid will begin the promotions of his upcoming film Kabir Singh soon. The film, directed by Sandeep Vanga, features Kiara Advani opposite the actor and is a remake of Telugu hit film Arjun Reddy. The teaser of the film is already out and has been received well by the audience. Kabir Singh is slated to hit the screens on June 21.